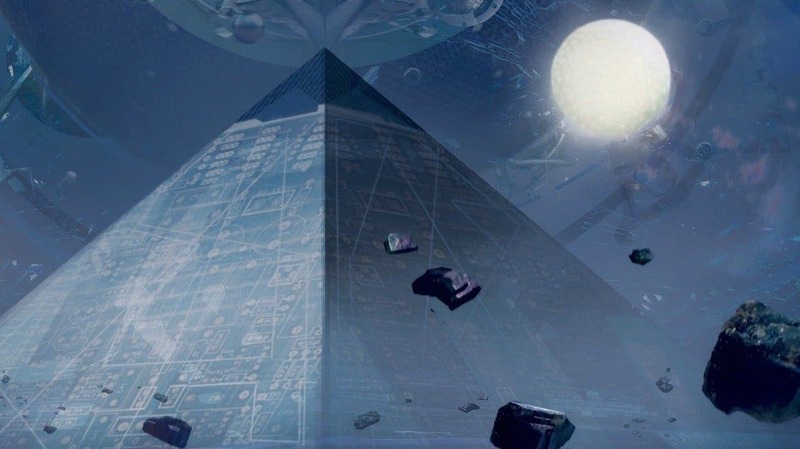 China's Cixin Liu's The Three-Body Problem (image above) is a stunning science-fiction novel that asks one of the oldest questions in SF: What would it mean for the human race to come in contact with an extraterrestrial intelligence? One of the main characters is a nanotech engineer, who's been swept up in a virtual-reality, online video game called "Three Body" that's so deeply metaphysical, it resembles a cult. When the story reaches its climax, it's unveiled a conspiracy that spans solar systems — one that not only threatens to alter the human race, but the very building blocks of physics that the human species has evolved to understand. In the end, the biology of the aliens, and the entire reason why they want to contact Earth, relates directly to the three-body problem –can you predict how three objects will orbit each other in a repeating pattern? The problem has baffled scientists for more than 300 years. As a character in the novel notes, “the three-body system is a chaotic system. Tiny perturbations can be endlessly amplified. 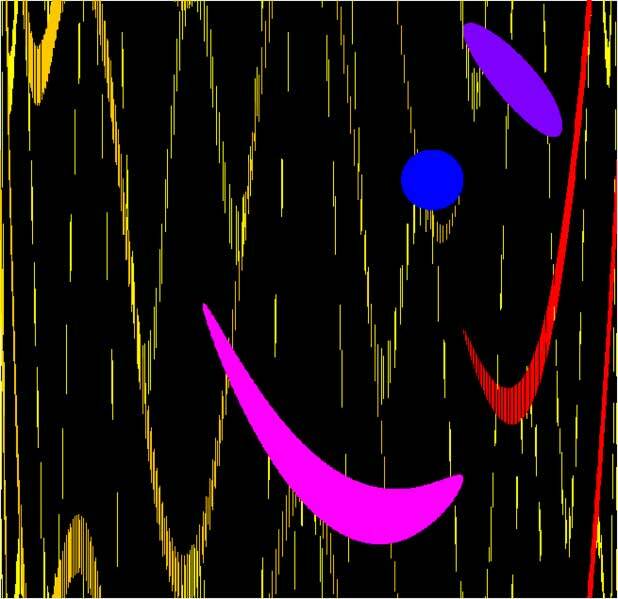 Its patterns of movement essentially cannot be mathematically predicted.” It is only quite recently that researchers discovered more than three families of solutions to it. In our real world, The famous three-body problem can be traced back to Isaac Newton in 1680s, thereafter Lagrange, Euler, and Poincare. Studies on the three-body problem leaded to the discovery of the so-called sensitivity dependence of initial condition (SDIC) of chaotic dynamic system. Chaotic dynamics is widely regarded as the third great scientific revolution in physics in 20th century, comparable to the relativity and the quantum mechanics. Thus, the studies on three-body problem have very important scientific meanings. Poincare in 1890 revealed that trajectories of three-body systems are commonly non-periodic, i.e. not repeating. This can explain why it is so hard to gain periodic orbits of three-body system. In the 300 years since three-body problem was first recognized, only three families of periodic orbits had been found, until 2013 when Suvakov and Dmitrasinovic [Phys. Rev. Lett. 110, 114301 (2013)] made a breakthrough to numerically find 13 new distinct periodic orbits, which belong to 11 new families of Newtonian planar three-body problem with equal mass and zero angular momentum. Currently, two scientists, XiaoMing Li and ShiJun Liao at Shanghai Jiaotong University, China, successfully gained 695 families of periodic orbits of the above-mentioned Newtonian planar three-body system by means of national supercomputer TH-2 at Guangzhou, China. These 695 periodic orbits include the well-known figure-eight family found by Moore in 1993, the 11 families found by Suvakov and Dmitrasinovic in 2013, and especially more than 600 new families that have never been reported. The two scientists used the so-called "Clean Numerical Simulation (CNS)", a new numerical strategy for reliable simulations of chaotic dynamic systems proposed by the second author in 2009, which is based on high enough order of Taylor series and multiple precision data with many enough significant digits, plus a convergence/reliability check. The CNS can reduce truncation error and round-off error so greatly that numerical noises are negligible in a long enough interval of time, thus more periodic orbits of the three-body system can be gained. As pointed out by Montgomery in 1998, each periodic orbit in real space of the three-body system corresponds to a closed curve on the so-called "shape sphere", which is characterized by its topology using the so-called "free group element". The averaged period of an orbit is equal to the period of the orbit divided by the length of the corresponding free group element. These 695 families suggest that there should exist the quasi Kepler's third law: the square of the average period times the cube of the total kinetic and potential energy approximately equals to a constant. The generalized Kepler's third law reveals that the three-body system has something in common, which might deepen our understandings and enrich our knowledges about three-body system. "The discovery of the more than 600 new periodic orbits is mainly due to the advance in computer science and the use of the new strategy of numerical simulation for chaotic dynamic systems, namely the CNS", spoke the two scientists. It should be emphasized that 243 more new periodic orbits of the three-body system are found by means of the CNS. In other words, if traditional algorithms in double precision were used, about 40% new periodic orbits would be lost. This indicates the novelty and originality of the Clean Numerical Simulation (CNS), since any new methods must bring something completely new/different. Many pictures of these newly-found periodic orbits of the three-body system are beautiful and elegant, like modern paintings (see above). "We are shocked and captivated by the perfection of them", spoke the two scientists. 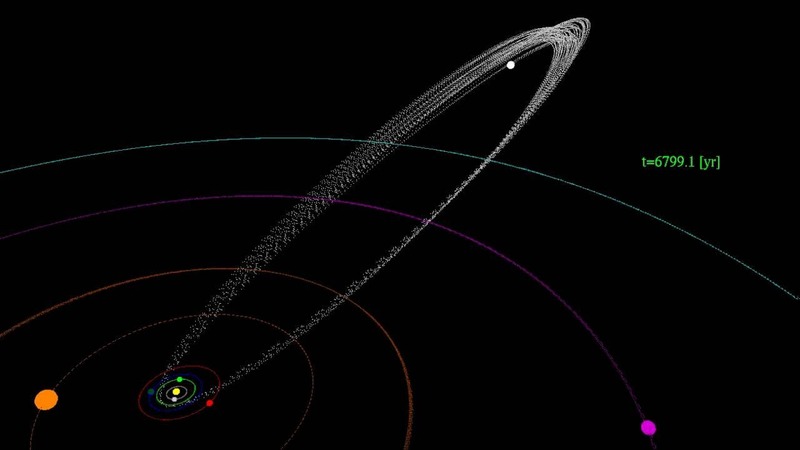 Image credit above: N-body simulation of the solar system illustrating the chaotic orbit of Halley's Comet.